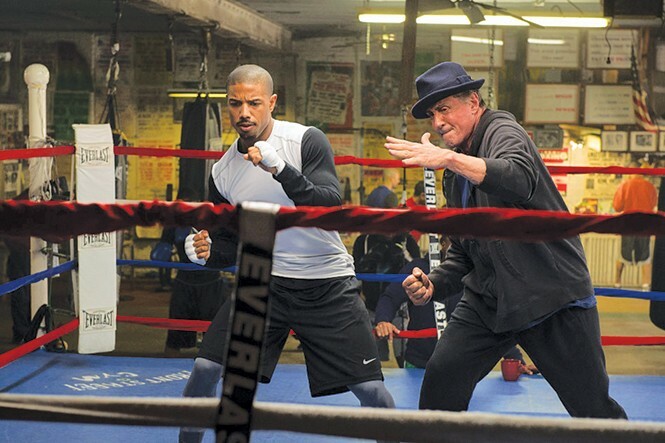 Creed smartly builds on the 40-year legacy of Rocky. If anything should be painfully clear as we approach the release of a new Star Wars film, it's how impossible it is to separate a movie from what we bring to it as viewers. The feverish anticipation is part of a 40-year-history and an emotional connection that may be only incidentally connected to whatever J.J. Abrams ends up putting on the screen. William Faulkner's celebrated quote—"The past is never dead. It's not even past. "—might as well be the marketing slogan for the perpetual reboot/remake/sequel cycle of contemporary filmmaking. Creed, coincidentally, also appears this year as the seventh installment in a 40-year-old franchise, and co-writer/director Ryan Coogler brings a fresh concept for revitalizing it. Yet, it would be crazy not to acknowledge that much of what works about Creed is built on a larger film-history context. Rocky Balboa's name may be nowhere to be found in the movie's title, but it's his soul that animates the story. In no way is that a slight to MichaelB. Jordan, who plays Adonis "Donny" Johnson. We meet the character first as an angry orphaned teen, rescued from the foster-care system by the widow (Phylicia Rashad) of boxing legend Apollo Creed. She has learned that Donny is the illegitimate son of her late husband, and has decided to take responsibility for him—and that unique backstory, as a tough kid brought into a life of privilege, gives Jordan the opportunity for a terrific performance. Jordan has a fascinating face on screen, one that can melt in an instant from ferocity into the look of a scared boy, and Coogler—who directed Jordan in Fruitvale Station—takes advantage of those characteristics to let the actor shine. Coogler also tries to place his own stamp on the Rocky legacy both through his story and his direction, with uneven results. It's an unexpected shift from the tradition of the series' boxing sequences when Coogler shoots Adonis' first big fight in one seemingly unbroken take, giving it an edgy energy that's perfect for a young fighter still learning on the job. But he also introduces a romantic subplot—between Adonis and his neighbor, a hearing-impaired musician (Dear White People's Tessa Thompson)—that feels about as perfunctory as a romantic subplot can feel, the kind of thing that plays more like a studio script note than a relationship that shapes Adonis in any way. That's largely because the truly significant relationship is between Adonis and Rocky Balboa (Sylvester Stallone), whom Adonis seeks out in Philadelphia to train him when he decides that fighting is his destiny. And it's hard to separate the appeal of Stallone's performance from seeing him return to the introverted, big-hearted Rocky of the original film. When Coogler shows him visiting the graves of his beloved wife Adrian and best friend Paulie, it feels like eavesdropping on a genuinely intimate moment, not like an actor trying to get back into a character by reverting to familiar tics. Creed builds an affecting connection between Adonis and Rocky—one of them in need of a father figure, the other a lonely man looking for his own family ties—but there's little question that the connection is as potent as it is because one of those guys is Rocky Balboa. Coogler is savvy enough not to mess with the formula of building up to one climactic showdown with a seemingly invincible opponent, in this case a British champ (real-life boxer Tony Bellew) looking for a last big payday before heading to prison. He even knows well enough to turn that fight into a rock-'em-sock-'em battle; the next time you see a guy fight defensively in a Rocky movie will be the first time. But the buzz of familiarity starts long before the fight itself, when we see Rocky pass on to Adonis that training technique of chasing a chicken around a yard. And then comes the moment in the Big Fight's final round when Coogler fires up Bill Conti's rousing old-school Rocky theme, and the hairs on the back of your neck stand up, and audience members involuntarily applaud. By the time Creed concludes with a walk up those iconic steps of the Philadelphia Museum of Art, it feels less like a passing of the torch than a recognition that the torches we all carry for beloved movies never really stop burning.